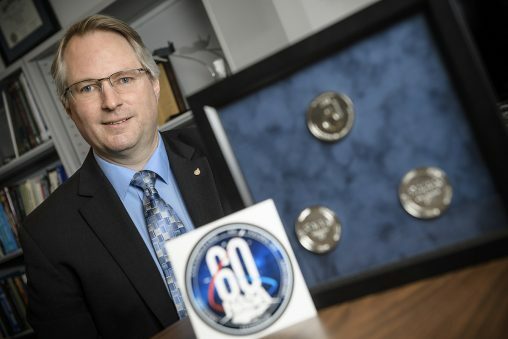 Joseph C. Slater, chair of the Department of Mechanical and Materials Engineering helped organized 101 sessions at the American Institute of Aerospace and Astronautics SciTech in San Diego. Joseph C. Slater, chair of the Department of Mechanical and Materials Engineering in the Wright State College of Engineering and Computer Science, played one of the top leadership roles at an annual aerospace forum in California that drew scientists and researchers from around the world. The American Institute of Aerospace and Astronautics is a professional society for the field of aerospace engineering, representing more than 30,000 members from 88 countries. From its creation in 1963, AIAA has organized conferences to serve the aerospace profession as part of its mission. Spanning over 70 technical discipline areas, AIAA’s conferences provide scientists, engineers and technologists the opportunity to present and disseminate their work in structured technical paper and poster sessions, learn about new technologies and advances from other presenters, further their professional development and expand their professional networks. In 2012, AIAA incorporated its individual technical conferences as part of five major forums, each focusing on a theme, Science and Technology, Aviation, Space, Defense, and Propulsion and Energy. The forums helped AIAA maintain and strengthen its role as the technical leader while becoming more relevant to a larger segment of the aerospace community. The strategy was designed to serve not only members focused on the traditional aerospace technologies but also those working further up the product chain, in process execution and mission applications as well as integration and systems. It was also designed to increase communication among the different groups involved in the aerospace development chain in order to enhance innovation.